Gangnam Wings (GW)is celebrating its first year anniversary this coming December 8, 2017, and to thank its loyal customers and patrons they are inviting everyone to join in and witness the celebration! Highlighting the event will be:The Lord of the Wings: WING-OFF CHALLENGE& Samyang Spicy Dry Noodle Eating Contest; the best part, however, is the fact that they’re having a BUY 1 TAKE 1 PROMO on all their Chicken Variants to the first 100 customers who dines-in on the 8th of December 2017, from 1:00PM onwards! The Lord of the Wings: WING-OFF CHALLENGE! 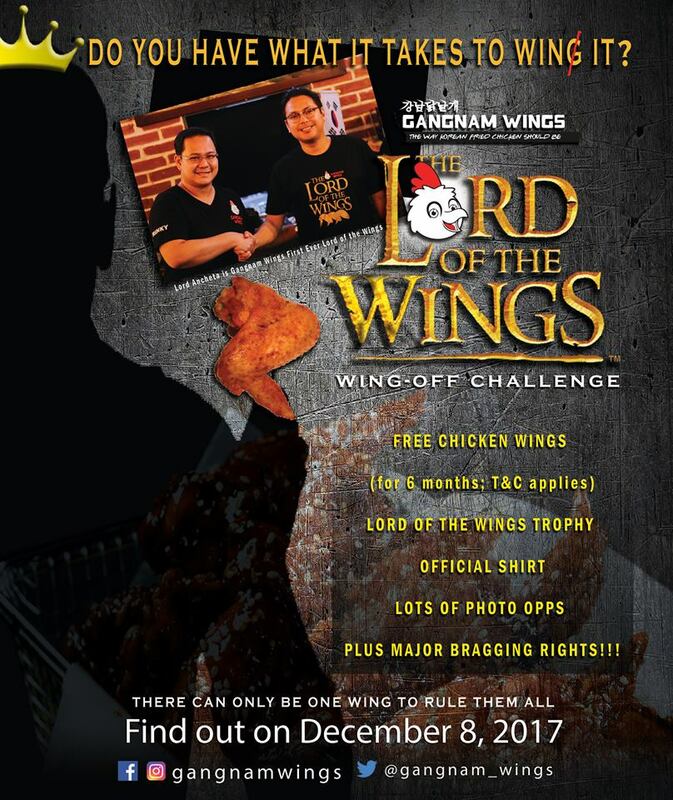 is a GW signature event wherein participants will have a chance to challenge Gangnam Wings’ reigning Lord of the Wings champ- Mr. Lord Ancheta, who recently won the first ever GW WING-OFF CHALLENGE against 2 other contenders after eating the most numbers of chicken wings in 5 minutes. The lucky winner gets FREE CHICKEN WINGS for 6 Months (particularly- 6 Pcs Goblin Wings each time customer dines in within 6 months from winning); a trophy, Lord of the Wings Official T-Shirt; and lots of photo opps plus major bragging rights!!! To all the spicy food lovers out there, thisSamyang Spicy Dry Noodle Challenge is for you! The notorious noodle brand ‘Samyang’ has been known to many as one of the spiciest products ever made which has influenced a lot of people to create online video challenges, worldwide. The rules in this challenge are pretty simple, the first to finish the noodles (without drinking if possible) wins. Easier said than done, but we’ll see who will be Gangnam Wings’ CERTIFIED HOTTIE! To join either of both challenges, customer simply needs to present some proof of purchase of any Gangnam Wings products upon registration. Only 3 contenders will be picked for each contest and notified via email. A waiver will be signed prior to the contest proper. This Anniversary event is brought to you in cooperation with Cook Magazine, Weekly Blueprint, SM Supermalls, San Miguel Corporations, Leiania House of Beauty, Rotary Club, Sofia, Health Frontiers & More and Health & Lifestye Bloggers group.